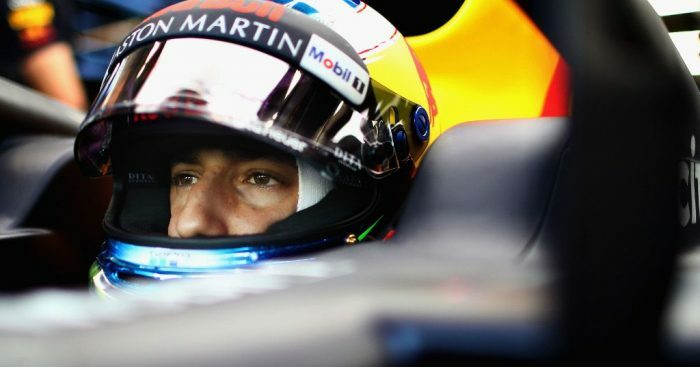 Daniel Ricciardo’s street circuit prowess was once again on display as he topped the timesheet in FP1 at the Marina Bay Circuit, heading a Red Bull 1-2. A heat haze and a track temperature of 46’C awaited the drivers at the start of Friday’s first practice for the Singapore GP. It is arguably one of the least relevant sessions on the grand prix calendar given that FP1 takes place late in the afternoon and the rest of the weekend at night. Pirelli brought their hypersoft, ultrasoft and supersoft tyre to Singapore with championship hopeful Sebastian Vettel posting the afternoon’s first flying lap on the hypers: a 1:47.831. As the drivers put in the laps, not only cleaning the track of dust but rubbering it up, the P1 times began to fall. Lance Stroll began his Singapore weekend, perhaps his last outing as a Williams driver, with an early spin as too did Valtteri Bottas. Both spun at Turn 1. Lewis Hamilton put in a 1:42.072 to top the timesheet after the first half an hour while Sergio Perez was another spinning as he got it wrong at Turn 20. Daniel Ricciardo was the next to lead the way only to be pipped by Bottas. The Finn bolted on a new set of soft tyres onto his W09 and clocked a 1:41.669. His team-mate wasn’t as successful as Hamilton flat-spotted his tyres when he got it wrong at Turn 1. Charles Leclerc followed suit moments later. Heading out on fresh tyres, Ferrari went 1-2 with 30 minutes to go with Vettel quickest on a 1:39.997. Kimi Raikkonen, who like Vettel was using the hypersoft tyres, was 0.4s off the pace. The final half an hour saw Red Bull switch to the hypersoft tyres with Ricciardo returning to the sharp end of the timesheet. A 1:39.711 for the Aussie. Ricciardo finished FP1 fastest of all, 0.201s ahead of Max Verstappen with Vettel third. Raikkonen, another driver to spin in FP1, was fourth ahead of Nico Hulkenberg, who is contesting his 150th grand prix this weekend. Hamilton, Carlos Sainz, Bottas, Charles Leclerc and Romain Grosjean completed the top ten. Leclerc blotted his copybook with a late crash, hitting the wall at the end of the Anderson Bridge. He damaged the front right of the Sauber. Stoffel Vandoorne was last on the timesheet as his MCL33 underwent massive set-up changes including the introduction of a new floor.